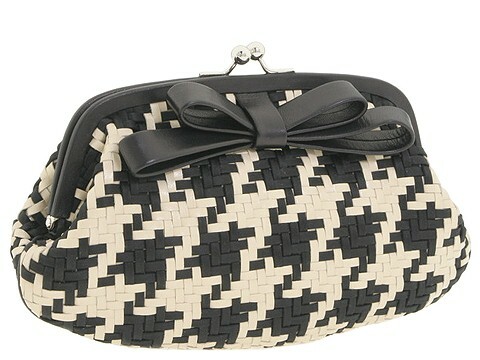 Woven leather takes this seemingly traditional herringbone pattern to a whole new level of chic on Moschino s 'Pouchette Bow Clutch. '; Holds your wallet, keys and a slim cell phone. Dimensions: 10 wide across the bottom, 7 wide across the top x 2 deep x 6 high. ; Leather bow on front. Top frame with a kiss lock closure. Satin interior lining with a back wall zip pocket. Made in Italy.